This question creates the framework for John Logan’s play Red (currently running at the Seattle Rep), centered on painter Mark Rothko; it also provides a point of departure for an investigation of Rothko’s painting. 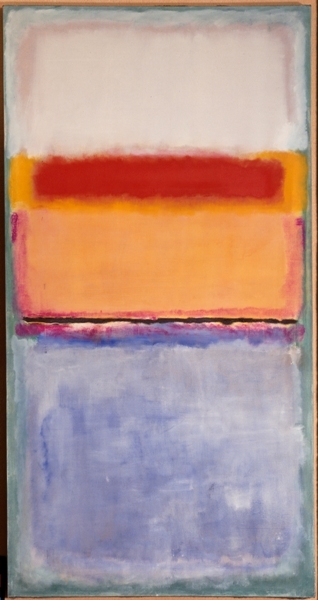 Rothko had worked in a traditional, figural mode early in his career, and dabbled in surrealism for a time, before finally arriving at his signature composition of pulsing blocks of color. For different viewers, the forms which emerge are stubbornly objective, ranging from biota to landscapes, humans to storm clouds. However, the strong verticality of works such as this resolutely assert their abstraction, mesmerizing viewers with a maintained focus on color and light. #10, 1952, Mark Rothko (American, born Russia, 1903-1970), oil on canvas, 81 3/4 x 42 1/2 x 2 1/4 in., Partial and promised gift of Bagley and Virginia Wright, 91.98. © 1998 Kate Rothko Prizel & Christopher Rothko / Artists Rights Society (ARS), New York.Currently on view in the Modern and Contemporary art galleries, third floor, SAM downtown.